United Nations (United States) (AFP) - Venezuela's foreign minister insisted at the United Nations on Tuesday that there is no humanitarian crisis in his country even as he announced plans to step up cooperation with UN agencies to help the economy. Foreign Minister Jorge Arreaza met Monday with UN Secretary-General Antonio Guterres -- his second meeting in a month -- as the stalemate hardened between opposition leader Juan Guaido, who has declared himself acting president, and President Nicolas Maduro. The United Nations has said it stands ready to ramp up humanitarian aid to Venezuela, where an economic meltdown has sent millions fleeing across borders, but requires consent from Maduro's government. "Let's not be so hypocritical in this conversation," Arreaza told a news conference at UN headquarters. "There isn't a humanitarian crisis. There is an economy that is subject to a blockade." Venezuela's economy is in a tailspin marked by hyperinflation and shortages of basic necessities that the opposition blames on corruption and mismanagement by the Maduro government. 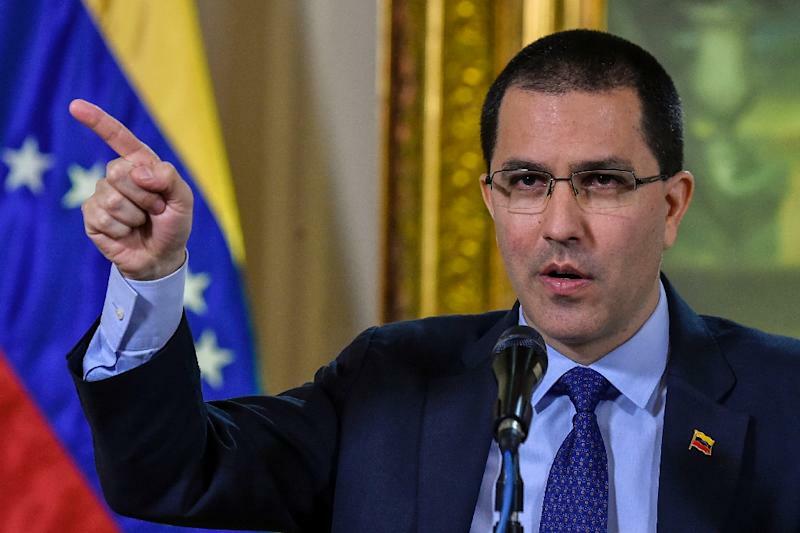 Arreaza said US sanctions were to blame and repeated his government's claim that the United States was using aid as a political tool, aimed at regime change. US aid has been piling up in Colombia at the border with Venezuela but a bridge border crossing has been barricaded by the military, under Maduro's orders. "A government that is threatening you with use of force, with invasion, with a blockade, that gives orders to other countries for them to block you, do they really want to provide you with humanitarian aid?" said Arreaza. "This is a hostile government that is killing you and then they want to help you out." Millions of Venezuelans have been left struggling with poverty, while 2.3 million have fled the country, unleashing a migration crisis in South America. The foreign minister said he had discussed "deepening cooperation" between Venezuela and the United Nations during his meeting with Guterres, but did not provide details. In Caracas earlier, the government signed two agreements with the UN Food and Agriculture agency and the UN children's agency UNICEF to beef up school feeding programs. The UN chief has offered to help broker negotiations between Maduro and Guaido to resolve the crisis. Guaido, the 35-year-old head of the opposition-controlled National Assembly, declared himself interim president on January 23 and has since been recognized by about 50 countries including the United States. Russia and China however continue to back Maduro, setting up a global split that has left the United Nations in a quandary. Guterres has said he would not join any group of nations promoting initiatives to address the crisis in Venezuela, so that he can maintain the credibility of his offer of "good offices" to the parties. The UN chief has stressed that he will not step in unless both sides ask him to play a mediating role.